Our menu offers both a host of vegetarian items as well as non-vegetarian items, try out our specialties - The Naan, famous Indian flat breads, Masala Dosas and Hyderabad Biryanis. You can choose your own menu from our large selection of Indian specialties whether you're looking to dine-in or takeout. We strive to make your every visit a true Indian dining experience. A new restaurant opened a few months ago in Aswaubenon by the West side of Green Bay which serves authentic Indian cuisine. India Bhavan is family owned and is opened every day but Monday. 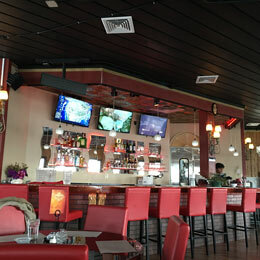 The interiors main color theme is red and black with many tables and booths. There is a bar with 3 televisions above and as you walk in there is a host which greets you and tells you where to sit. The walls are all wood paneled with crystal silver light fixtures throughout. The décor is casual and in the background soft Indian music plays. I stopped in for their lunch buffet which is served Tuesday through Sunday from 11:30 – 2:30. The cost of the buffet is $12.99 with a huge variety and was nicely set up towards the back. It consisted of 2 different soups and 26 different entrees. 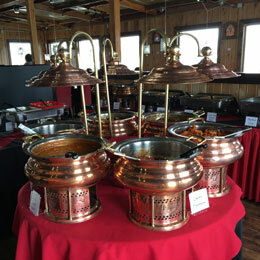 On a round table there were beautiful copper dishes filled with wonderful savory variety of meats in sauces. All the food is made in house from the families own recipes. Everything I tasted was delicious and there was always someone close by making sure everything was kept full and also if you had any questions. 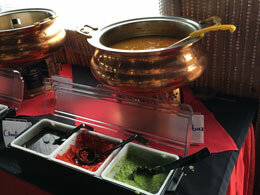 India Bhavan dinner hours are Tuesday through Sunday from 5:00 – 10:00 but on Sundays 5:00 – 9:00. They have a wine list, top shelf liquors and domestic and Indian beers.